Lauren Kieffer and Tigger Too at the Jersey Fresh CCI3*. An eventing horse owned by US Equestrian Federation president David O'Connor died during the cross-country phase of a horse trials event at the weekend. The accident happened at the Jersey Fresh CCI3*. 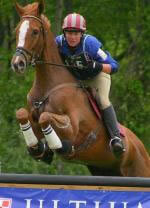 A preliminary necropsy found that Tigger Too, a 17-year-old gelding ridden by Lauren Kieffer, died of an acute abdominal aortic rupture. Final necropsy results are pending. The pair fell at fence 28, and Kieffer was uninjured. The US Eventing Association said that the FEI investigative panel has been convened to review the facts surrounding the incident, and more information will be released once the investigation is complete.